The criteria for applying for college include an essay that is the main part of the application, which student submits to the college for being a part of their environment. Here students have the opportunity for showing the administration of the college about their self; none of the other parts of the application can provide this opportunity. So, they must try to avail this opportunity in the best way they can. The essay that student write highlights their interests, mood set and field of work. The first thing that is needed to remember before writing college essay is, try to be the one that you are in actual don’t pretend or make yourself that you are not in reality. The second significant tip that I want to suggest is start the things earlier so that you can do them in a good and perfect way. Check the tips below for approaching the useful techniques for crafting your college admission essay. In this article will suggest the things that you need to do and the things that you must avoid. Don’t make the matter of your attention only a selected college that has some aspects for influencing you, the purpose of your attention must be your aim, your achievements so just focus on them. Do share your feelings and thoughts by means of creative wordings for writing your essay. Here you can emphasize on the things that you cannot do in any other part of your form. Don’t think that you can wrap many topics in just a single essay. It will create a mess; remember that you are writing your college essay not submitting your resume. Do concentrate on the facts that are related to you and can describe you in a good way so that the reader can get a clear idea about you and your personality. Write in such a way that the reader can analyze moral of your essay. You can take help from your surroundings like your parents, siblings or teachers request them to read the intro of your essay and tell you what idea they are getting by reading it. Don’t only give statements for telling the features in accordance with the main idea. Do mention the details of the facts that prove your statement correct by means of different examples and causes. Don’t just depend on the expressions and ideas of others try to use your own wording as much as you can. Don’t use business language in your writing, it has an over texture that gives vague look to writing. Avoid using the words that are not having any worth in your essay. Do use the wording of your own, the wording that reflects your opinions and voice. If you use phrases of others the checker will find it out and in that case, you have to face a huge problem. As well as editing in your essay by other will also be visible to the reader, as the difference in writing will highlight the involvement of someone other. Don’t resolve it without making sure it is properly proofread. Stop focusing on the application like spell or grammar checking, as it overlooks the typos. Do request someone to proofread your essay. You can take help from your teacher, friends, parents or siblings; they can easily grab the mistakes from your essay. Or you can take help from a person who has writing similar to you. These tips are really useful and essential to follow as it gives a creative, perfect and original look to your essay. Keep in mind that the examiner has limited time for reading essays so be sure that you have created X-factor through your work for making his eyes stuck on yours. The professional writers of EssayDone.co.uk can assist the students in writing their perfect dissertation topics of university level. 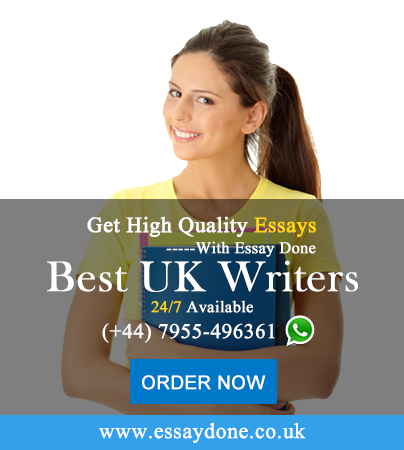 Writers of EssayDone.co.uk are ready to give their helping hands to the public of UK by writing on any topic related to their dissertation. Instead of doing your assignments and essay’s you can hire a writer. We are ready to support you in providing writing help whenever you need.